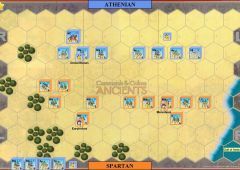 The first great Hoplite battle of the Peloponnesian War was fought between Athens and Boeotia. 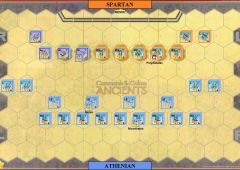 The Athenians formed a plot with some Boeotian democrats to overthrow the Theban autocracy. 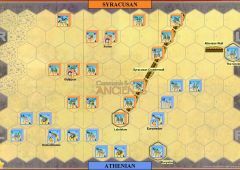 Demosthenes led an expedition in the west, while Hippocrates led the main Athenian army into eastern Boeotia to seize Delium. 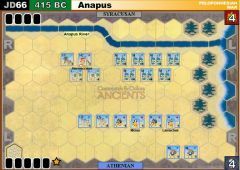 The coup failed, and Hippocrates fell back towards Athens. 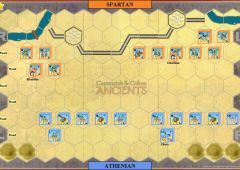 Meanwhile, the entire Boeotian League had been called to arms and 7,000 Hoplites, 10,500 light troops and 1,000 cavalry under Theban general Pagondas intercepted the Athenians just as they crossed the frontier. Pagondas formed his Thebans on the right in a mass, with the Sacred Band in the van. 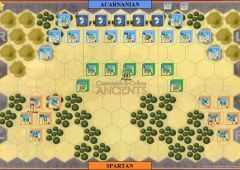 The battlefield was narrow, so most of his light troops and cavalry had to be held back. 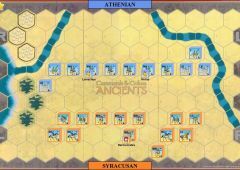 Hippocrates was caught by surprise, but the Athenians were able to form up before the Thebans reached them. 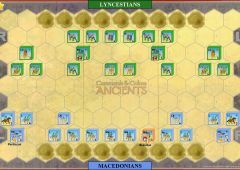 Hippocrates positioned himself on the right with the pick of his army. 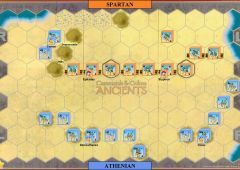 Pagondas led the charge of the massed Thebans, and forced the Athenian left back, but it did not break. 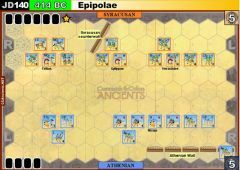 Hippocrates led the Athenian right in a countercharge and shattered the Boeotian left. 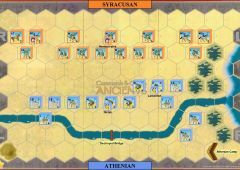 At this juncture, Pagondas ordered his reserve cavalry to attack the victorious Athenians. 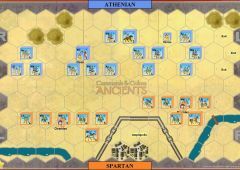 The Athenians, mistaking the few horsemen for the advance guard of a new army, panicked and broke. 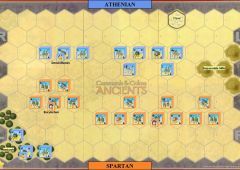 The Athenian left, hard pressed by the massed Thebans, collapsed at the same time. Hippocrates was among the slain. 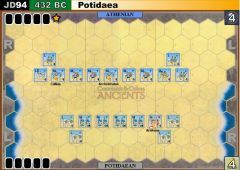 It was a great victory for Pagondas, and Athens would not threaten Boeotia again during the Peloponnesian War. • The Theban Sacred Band is a special unit. 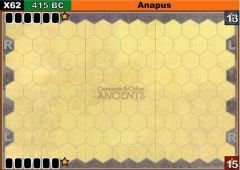 Place a special unit block in the same hex as the Sacred Band unit to distinguish it from the other units. 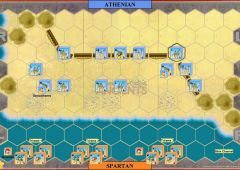 A bronze five-block MH unit is used to simulate the 25 deep Theban phalanx. 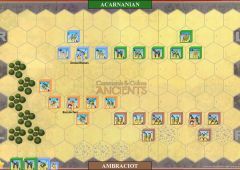 The Sacred Band will roll four dice, but will score a hit for each leader symbol rolled in close combat (even when a leader is not attached or adjacent), and may ignore one flag. 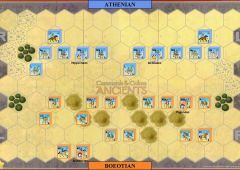 3 good and different games with a 2-1 to the Boeotians. 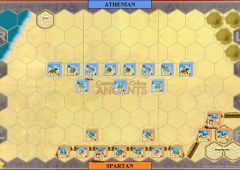 The first game had a Boeotian left-wing attack with the hoplites and combined cavalry routing the Athenian right to secure victory, but at 6-5 banners. 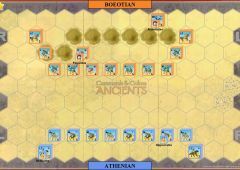 The 2nd game was a more desultory skirmish and attrition with the Boeotian right piling in to secure victory, again 6-5. 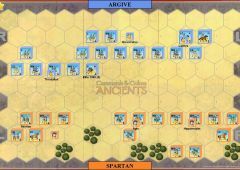 The third game was an all-out hoplite onslaught by both sides resulting in a decimation of both sides' citizen troops. 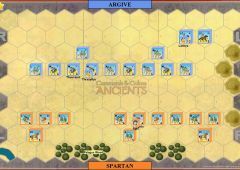 At 4-5 against the Athenians, and with hoplites now thin on the battlefield, the Athenians concentrated their skirmishers against a wounded Boeotian hoplite unit led by Pagondas and eventuall took down the hoplites with javelin fire and then Pagondas himself to secure victory 6-5 to the Athenians. A very balanced scenario.